Some people enjoy receiving admiration, while others can feel a bit awkward about it. Not everyone enjoys being doted on in this way and it can actually be a bit draining for them at times. 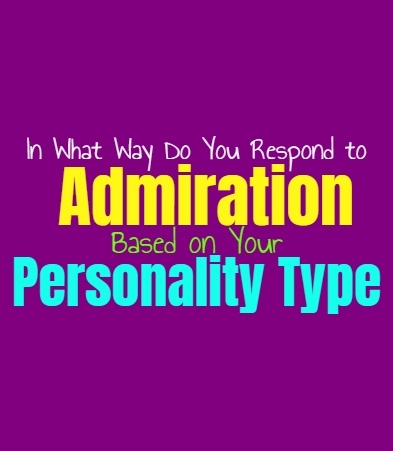 Here is how you respond to receiving admiration, based on your personality type. INFJs do enjoy feeling a sense of appreciation, but too much admiration can make them feel a bit bashful. They don’t like feeling like all eyes on them, but the right eyes can truly make them feel proud. If someone the INFJ loves and respects shows them serious admiration, it can make them feel both validated and loved. They might seem a bit shy over this at times, but in truth they enjoy feeling this way and are excited when someone admires them. ENFJs do enjoy feeling admiration, especially since they are perfectionists. If they feel this admiration from others it often gives them a sense of validation that they are living up to their own expectations. ENFJs do care what others think, especially when it comes to their loved ones. They want to be sure they are saying and doing the right things, and don’t want to let others down. For the ENFJ admiration means that people are noticing how hard they work and it makes them feel like they have done good. INFPs can become a bit shy when they experience too much admiration, especially if it puts them on the spot. They do like feeling as if their loved ones appreciate them, and deep down admiration is something they do enjoy. While they might enjoy the feeling it can also make them a bit uneasy, or feeling like they are being put on the spot. INFPs do their best to respond well to someone admiring them, but at the same time they don’t want to be put on a pedestal they cannot live up to. ENFPs don’t mind a bit of admiration, especially when it feels sincere. After a while it can make them feel a bit uncomfortable, but at the same time they try to accept it graciously. ENFPs do enjoy receiving positive attention, especially from someone they care for. For them a sense of admiration makes them feel like they are beloved and the people around them actually care. It does matter to the ENFP how others see them, and so a sense of admiration is something they enjoy. INTJs don’t necessarily care much for admiration, especially if it feels insincere. If someone showing them admiration feels overwhelming or exhausting, the it will definitely irritate the INTJ. They would much prefer receiving respect from others, and want to feel like they have achieved something they can be proud of. INTJs do enjoy admiration in some ways, as long as it feels like it comes from a place of achievement and accomplishments. ENTJs do enjoy feeling a sense of admiration from their peers, especially when it pertains to their accomplishments. They enjoy feeling like people actually recognize how hard they work and everything they have achieved. Admiration for the ENTJ is valuable, especially if it comes from a deep respect for the ENTJ and everything they have done. They definitely won’t turn away someone’s admiration, and do appreciate feeling valued. INTPs don’t really enjoy admiration, since it can make them feel uncomfortable. When someone admires the INTP it can also leave them feeling stressed, like they cannot quite live up to it. They don’t enjoy feeling this type of pressure from others and would much rather a more subtle sense of respect and appreciation. Feeling admired can be stressful for the INTP, and isn’t necessarily the type of attention they want to receive. ENTPs really don’t mind feeling admired, as long as it isn’t from the people who are very close to them. They would rather their close friends and relationships be based on mutual love and respect, rather than admiration. When it comes to acquaintances or distant friends, they actually do appreciate the admiration. ENTPs might enjoy feeling special in this way, since they really don’t mind having the attention on them. ISTJs don’t really mind being admired, as long as they feel their accomplishments are being recognized. If people admire them for their strength and things they do in life, it can be enjoyable for them. ISTJs don’t necessarily go after admiration, since they often prefer a sense of respect. They focus on getting things done and being in the spotlight too much can be a bit exhausting for them after a while. ESTJs might actually enjoy feeling admired, especially by people they care for. Feeling like those around them actually respect and admire them, can be deeply rewarding. ESTJs don’t want to feel like their hard work is being forgotten, or like those around them do not appreciate everything they do. ESTJs certainly don’t mind feeling admired, as this can bring them a sense of pride and accomplishment. ISFJs don’t mind a little admiration, as long as it doesn’t put them on the spot too much. They enjoy feeling like their accomplishments are being recognized, and like the people around the ISFJ appreciate them. They work very hard to care for others and so it matters how those people see them. ISFJs really don’t want to feel like they are letting people down though, and so too much admiration can be a heavy burden. ESFJs don’t mind receiving admiration from those round them, especially when it comes from a sincere place. Too much admiration can be overwhelming though, as if makes them feel like they have far too much to live up to. ESFJs already put a lot of pressure on themselves, and so feeling admired makes them feel like they cannot fail in this person’s eyes. ESFJs want to feel appreciated and recognized, but overwhelming admiration is something which will be stressful for them. ISTPs don’t really care for admiration, but they don’t mind it either. As long as they don’t feel constantly doted on, then ISTPs don’t mind feeling like people admire them. They do however, need to feel free to make their own choices and even make mistakes as they please. If they feel too much admiration or like they are placed on a pedestal, it feels overwhelming and exhausting after a while. ESTPs don’t mind feeling admired, and might even enjoy feeling the attention. They just don’t want to be ignored and forgotten, and so a sense of admiration can be rewarding for them. ESTPs don’t want to feel like they are on a pedestal and cannot make a mistake, but they do enjoy feeling the sense of attention. They don’t like feeling ignored and so admiration is often a much better option. ISFPs don’t mind being admired, especially by their loved ones. They don’t like feeling so much admiration that they are overwhelmed, but they do enjoy feeling loved. For the ISFP too much constant admiration is something which will drain them a bit, and make them feel like they are being watched. They do however, enjoy feeling like their loved ones appreciate them and the things they do.